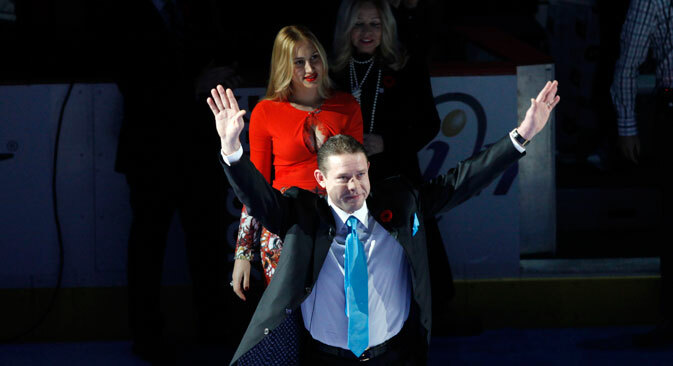 Russian hockey start Pavel Bure achievements was celebrated in Vancouver before the NHL Canucks’s game with Toronto with an official ceremony that lifted his jersey to the rafters at Rogers Arena. To mark this event, Rossiyskaya Gazeta looks back on the most significant facts about the player from the biography of "The Russian Rocket." 1.Pavel Bure was nicknamed "The Russian Rocket" for his incredible speed. "In Russia we have the Kalashnikov gun and a hockey player from outer space named Bure. Catching Pavel is like competing with a bullet," the Canadian and American press wrote about Bure. 3. In 1990 Bure became a world champion as part of the Soviet national team, the only gold medal of his carrer. Then he moved abroad. In 1994, headed by Bure, Vancouver reached the Stanley Cup finals, only to be beaten in the playoff by New-York Rangers at the end of seven games. During the 1998 Olympics in Nagano, Bure almost entirely by himself led the Russian team to win the silver. In the finals the phenomenal Czech goaltender Dominic Hasec stood in the way of Bure to become champions. 4. In the NHL, Bure scored more than 60 goals in a season two times and took part in the NHL’s All-star Games six times. The Russian hockey player won multiple individual trophies, including the league's rookie of 1992, two awards for the leading scorer in a regular season, and the title of the most valuable player of NHL’s All-star game in 2000. In 2005, at the age of 34, Bure ended his professional career because of a chronic knee injury. 5. Bure was the sixth Russian hockey-player to be elected into NHL’s Hall of Fame after Anatoly Tarasov, Vladislav Tretyak, Vyacheslav Fetisov, Valery Kharlamov, and Igor Larionov. 6. In 2007 Bure won a lawsuit he had filed against British Airways after being kicked off a Moscow-London-Los Angeles flight. The hockey player checked in, took a seat and waited for takeoff. However, a captain of the British aircraft suddenly said that he would not fly with this man onboard. An astonished Bure demanded an explanation. The Englishman said that Russian soccer fans flew the plane from Moscow to London the day before. They were rocking the plane while in the air, thousands of miles above the ground. When Bure reasonably asked what it had to do with him, the English pilot said that he looked like a soccer fan. Bure had to leave the plane and take the next flight, this time in economy class. As a result the court ruled in favor of Bure in a total amount of 57,000 rubles for new tickets and 10 thousand rubles as compensation for moral damages. Bure never received an apology from the airline. 7. On October 10, 2009, Bure married the model Alina Khasanova. The couple met by chance - in 2005 they were both on vacation in Turkey. Alina gave birth to a son, whom the couple named Pavel, after his father. 8. Bure is one of only a few athletes with a PhD. Bure holds a PhD in law.